Bon’App always recommends that our users eat plenty of fresh fruit and vegetables, but what about frozen, canned, and dried fruit? Well, fresh is always best, but keep reading to learn more about the other options! Frozen fruit, after fresh, is your best option. None of the nutrients are lost, no sugar or salt are added, and the volume of the fruits stays the same – meaning you fill up just as quickly. Use frozen fruit in smoothies, as a yogurt or cereal topping, or just a refreshing summer treat. It’s a good way to get fruit that isn’t in season, and assures you that it is perfectly ripe. – and it’s usually cheaper, too. Canned fruit is much trickier. Unfortunately, fruit is often canned in sugary syrup which adds unnecessary calories, and the cans themselves can be leak BPA into the food. 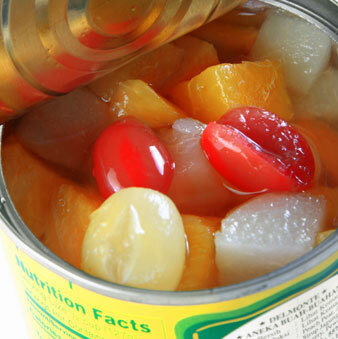 If you are buying canned fruit, look for things packed in water, light syrup, or juice (in that order!) and definitely avoid heavy syrup. Some vitamins are lost in the canning process, and some fruits like pears will lose fiber because they no longer have their skin. Bon’App does not recommend buying canned fruit if other options are available. Dried fruit can be a great snack, but make sure to watch your portion sizes! Because most of the water has been evaporated from dried fruit, it packs a lot of calories and sugar into small volumes. A half-cup serving of dried apricots has 156 calories and 34 grams of sugar – the USDA recommended amount for a whole day for many people! Be careful to not overindulging in dried fruit, but don’t cut it out of your diet completely if you enjoy it. Happy snacking, Bon’Appers, and remember to get plenty of fruits and veggies every day!